This graph, from "economonitor," is very interesting because it contains so much relevant information. (However, note one detail: the title of the graph, "Miles Driven" is somewhat misleading; it should be "mileage", as the text of the post clearly says.) The relation of mileage to hourly wages is a parameter worth examining because it tells us a lot about the "systemic" efficiency of road transportation. What kind of efficiency can we actually afford? Now, the graph shows a clear "peak mileage" which occurred around the year 2000, when Americas could afford the highest mileage from their cars in history. It was an efficiency peak of the road transportation system. But then, this efficiency diminished. How can we explain that? 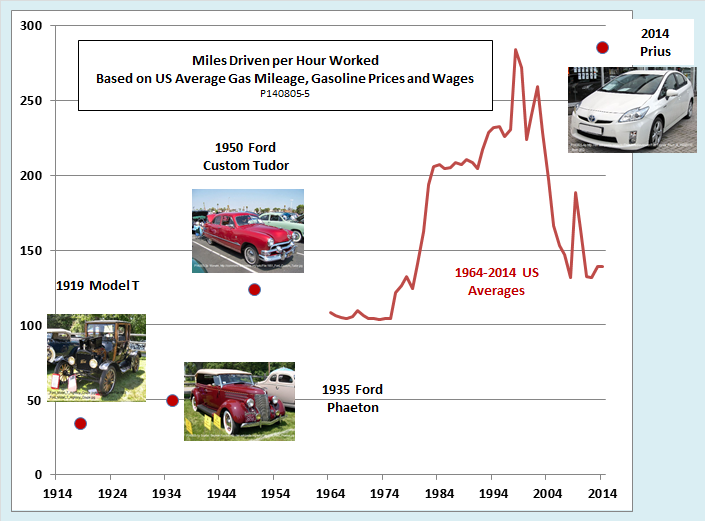 The data of the graph depend on three factors 1) the cost of gasoline, 2) the average hourly wage, and 3) the average mileage of cars. Let see first the behavior of oil prices, which determine gasoline prices. 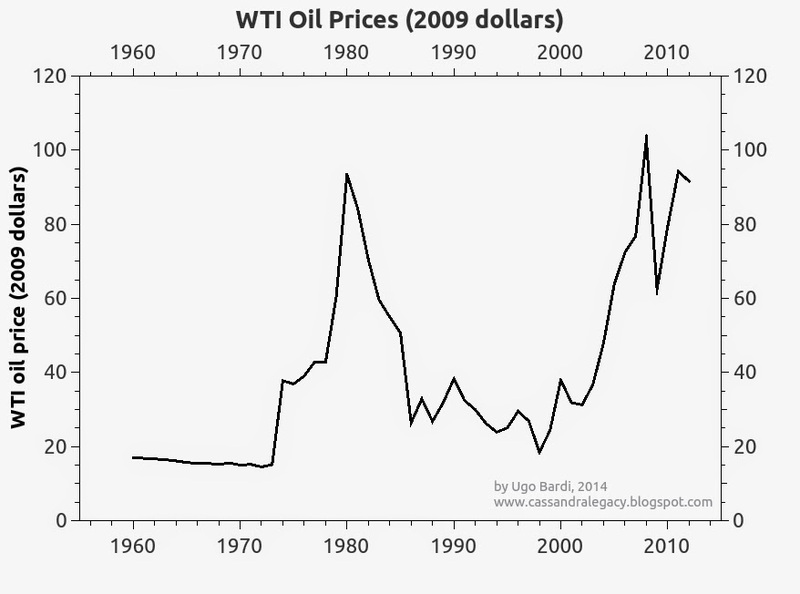 You see how oil prices spiked twice during the past 50 years, with the first and the second (ongoing) oil shocks. Amazingly, after the start of the first oil crisis, the mileage per hour worked increased, despite the steep price increases. But the opposite took place with the second oil crisis, mileage per hour worked rapidly decreased. Something must have compensated the price increase during the first crisis, but that is not occurring during the second. Why? You see how quickly mileage increased throughout the 1970s - it nearly doubled in less than 10 years! And you can see how quickly people forgot about the oil problem once prices collapsed in the second half of the 1980s. The graph also shows that, with the second oil crisis, mileage restarted to increase, but by far not as fast as in the 1970s. There is a reason: it is difficult to optimize something already optimized. This we call 'diminishing returns of technological progress." In the end, it looks like the "peak mileage" of the late 1990s is the real one. 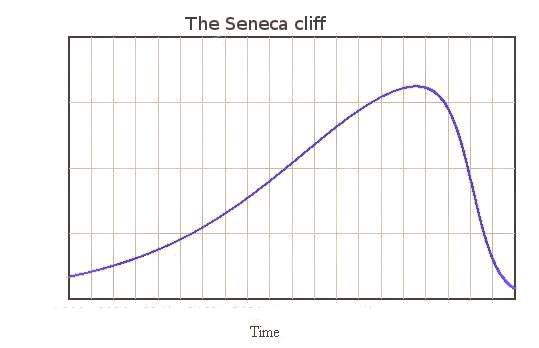 In the future, the a combination of factors which led to the peak will never return. Oil depletion is destined to make oil less and less affordable, even though market oscillations may hide this phenomenon. 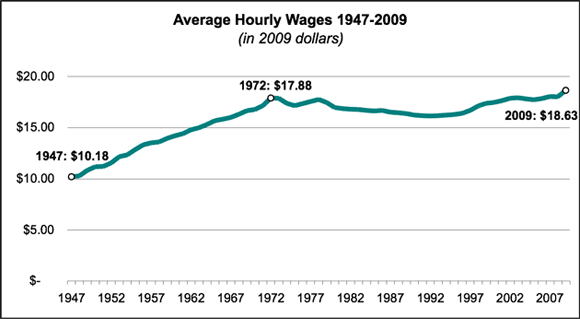 Wages are unlikely to grow in real terms after having been static for the past 40 years. And technological miracles are unlikely. Even the Toyota Prius, technological marvel of our times, can only bring us back to where we were 15 years ago in terms of mileage per hour worked. As long as we remain within the paradigm of "road vehicle powered by a combustion engine" we have reached the limit of what we can do. The result of the reduced overall efficiency of transportation we can see in this last graph (from advisorperspectives). In the US; people are driving less. Perhaps there are behavioral factors involved, but "peak mileage" suggest that they are doing that because they can't afford to drive more. I believe, that there is a considerable mileage increase in the making by downsizing engines, switching over to diesel and use of new configurations like the two stroke - opposed piston principle, which seems to be very promising. Look at achatespower.com, ecomotors.com. 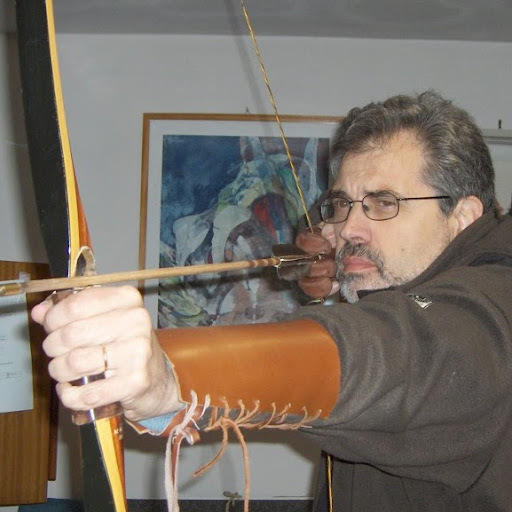 The decisive factor here is the client, the buyer: will he (and it is mostly a he) withstand the temptations of horsepowers and buy reasonable?